Doctor [measuring a sizable hole with his scarf]: It seems you have a very large rat brigadier — maybe you should employ the services of a very large cat? Whether you want to wear this scarf as part of a costume for Halloween or a Comic-Con, or if you simply want to subtly display your love for the fourth doctor, this Short Scarf is perfect. It is 6.5 feet long, making it the ideal length for wrapping it around your neck or fighting enemies! It is a multicolored acrylic scarf, fitted with yarn tassels at the ends. 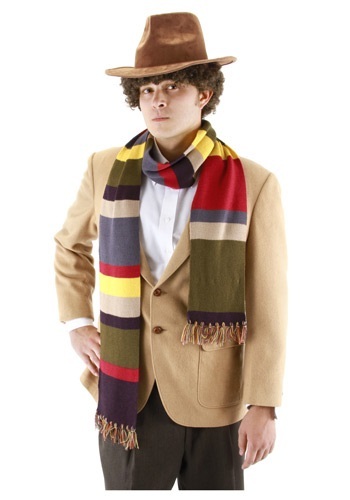 We have included a list that you might find useful, when compiling your best Doctor Who cosplay. Jelly Babies (check), Sonic screwdriver(check), Fourth Doctor Who Short Scarf (double check). Now that you have everything you need, step into the TARDIS and get to traveling!